Yeah like many others its both of our first but not our last. Megs that yours turned out really nice and Raptor OMG those are awesome! Interests:My wife, my dogs, my family, my beer and my life. 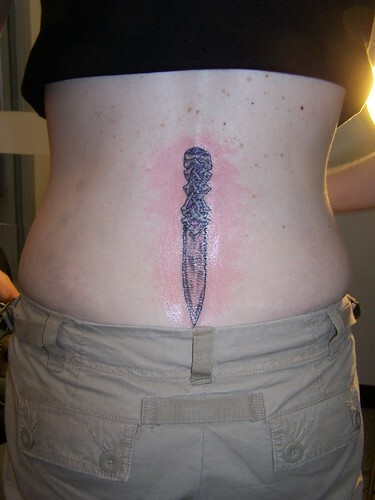 Ok, here are mine...I am going in soon to have them touched up. 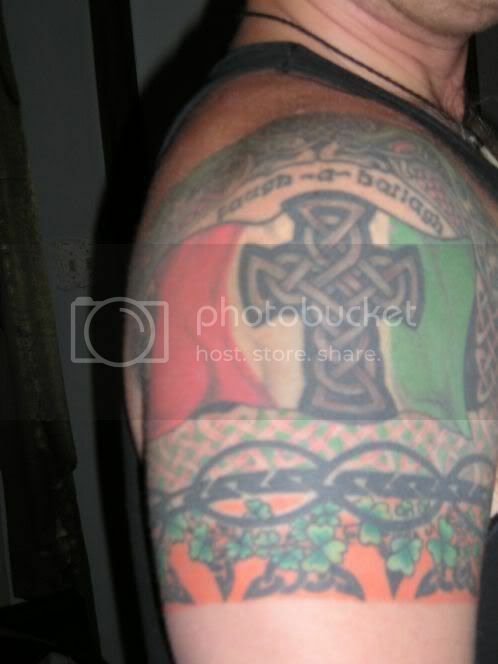 The Irish arm, I am going to add flames all around the entire design. 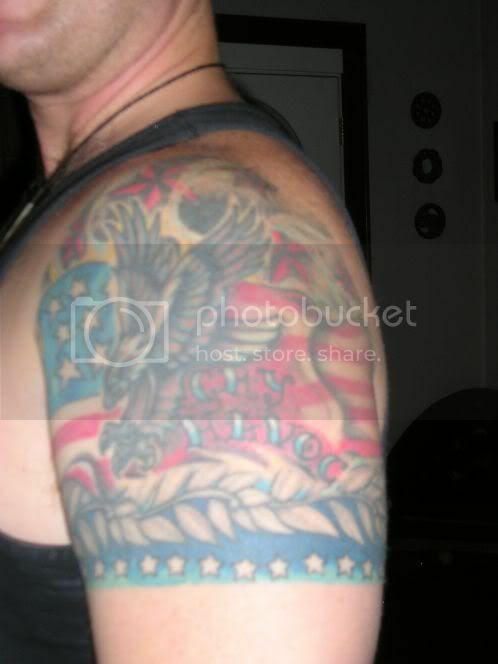 The American arm, I am going add water (preferably Asian style water-work along the lines of "The Great Wave"). 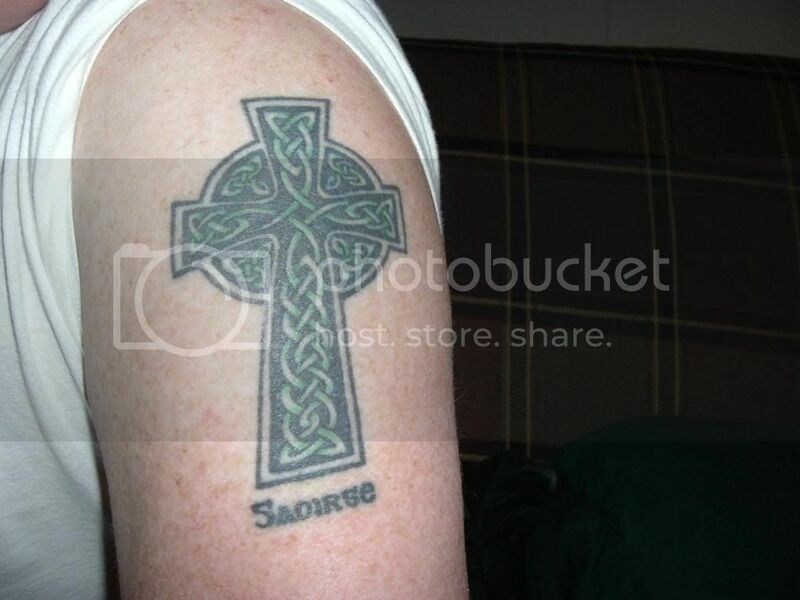 And yes, I am aware that the cross on the Irish arm has some errors in the knotwork (over, over and under, under). Oh well. i like your nautical stars. it's a nice touch to the American shoulder. Hard call, as I have over 3000 tattoos. My favourite is probably the Pictish work on my face (done by my wife), but seeing that I usually forget that it's there (out of sight, out of mind) my hands are probably the ones I'd pick. The work is by my wife once again, & they're not finished quite yet. 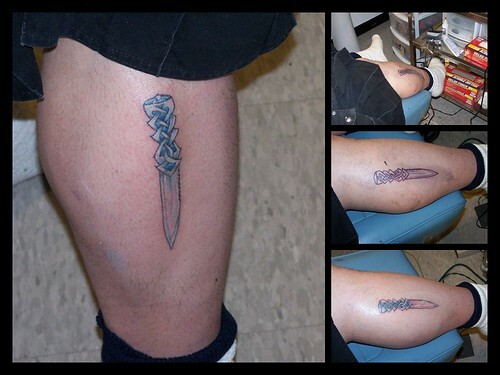 I would guess from the tattoos that you're a Gordon. Hello cousin! I'm Turpin's brother. I gather you have one of his sporrans. Hi back, cousin! Yes I do, I'm the proud owner of #32, & it's easily the best I own. Will add mine now. Only have two favorites because I only have two at this time. One day will have a harp surrounded by shamrocks on a calf. Thanks, KT. They made them from drawings I did. that makes them even better! 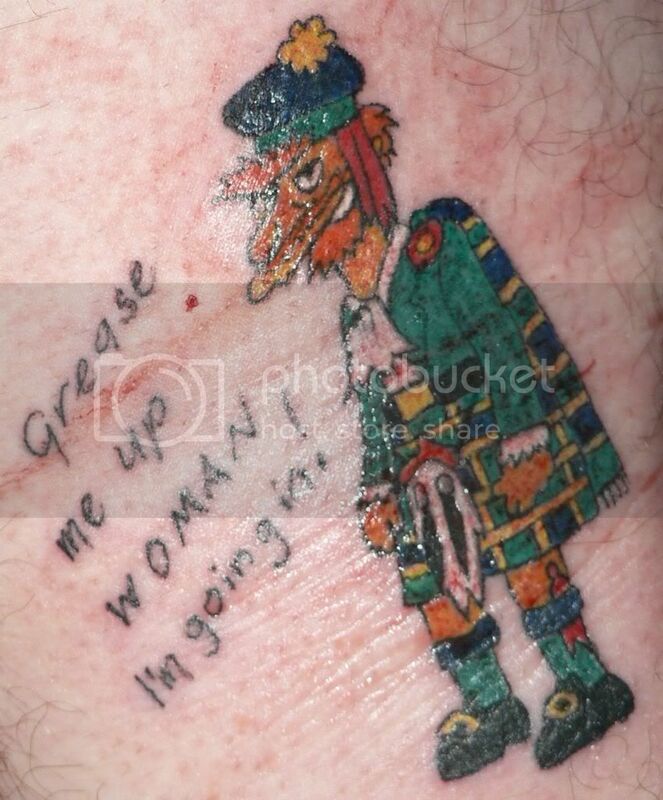 hmm cool tat megs. good size. great color. i guess ill have to post pics of mine soon. not from my experience, a lot of it is the quality of the ink in which the artist uses. my cheesy seaweed looking flames on my right ankle/calf are done in a red and yellow that are the same shades t hey were when i got them done. 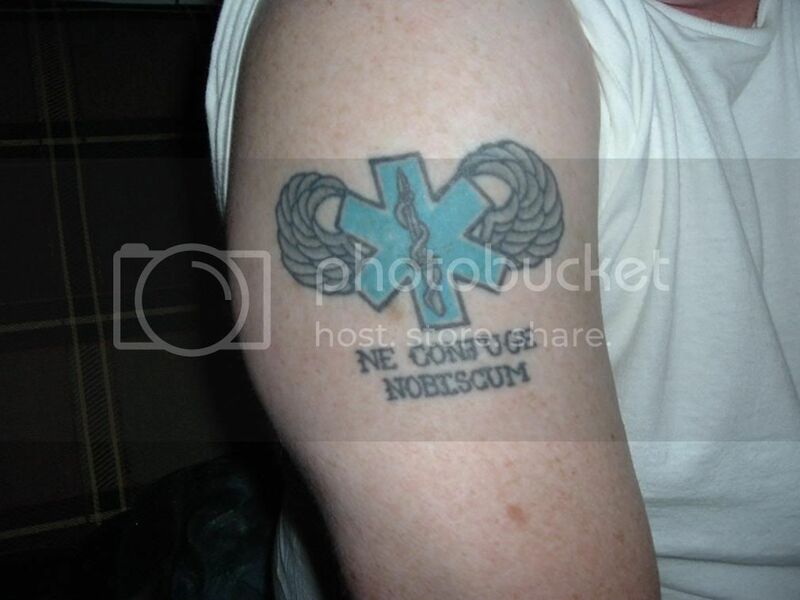 ive got one that the black faded a bit, but thats the ink they used not the tat.the black outline on the flames, and my lettering on my left bicep havent faded a bit. #$%$#%$%, at work and no pic except for a few will come through the firewall. oh well i will have to look at these when I get home. I know how ya feel there Judge, It's the same way for me here at work and really jerks my chain at times. the computers where i work(Lowes of blytheville AR) all of them run a system just barely better than DOS. and im not joking at all, it still uses command prompt and requires key stroke entry only on most of the systems(except for the special order program and in the training room). i usualy have to get on here from my blackberry phone while at work. Sounds like the same crap we had when I was working part time for Home Depot..
Ditto that... I went to Lowe's a few weekends ago to pick up some grill accessories and about three hours later I get a phone call.. "um, are you ok, did you get lost?" It's like a toy's R us for adults. I do almost all my home repair and improvment shopping at Home Depot and have never had any problems there, but I also have never had any problems at lowes either. I like Home Depot (Atlanta based and sponsors several things I REALLY like), Lowe's (sponsor of one of my least favorite NASCAR drivers, not that he is bad, but that he wins too much-> Anna calls him "unibrow" though he has lasered it now), and Toys R Us (oh those wonderful toys). Now, what was the topic.